We were living in an era where terrorism visibly was a copyright of few nations but off late these days it has become an everyday affair in most of the geographical locations around the globe. Millions of innocent people lose their lives and pay for mistakes that were never theirs. Every country at every conference is seen discussing the same issue but fail to find a solution to completely eradicate terrorism. · BLACK SEPTEMBER: The Olympics have never experienced a darker day. During the 1972 Munich Games, the Palestinian militant group Black September took the Israeli national team hostage, eventually slaughtering eleven athletes and coaches and one German police officer after a 16-hour standoff. · CRICKET CHAOS: En route to their cricket match versus Pakistan on Tuesday, March 3rd 2009, the Sri Lankan team bus was attacked by roughly a dozen gunmen, who fired an assault of rockets, grenades and multiple rounds of ammunition at the cricketers and their police escorts. Eight were killed and six injured. · MARATHON MASSACRE: In 2008, a suspected Tamil Tiger suicide bomber detonated a device at the start of a marathon celebrating the start of Sri Lanka's new year, killing a dozen people and injuring almost 100. Highways minister Jeyaraj Fernandopulle, former Olympic marathon runner KA Karunaratne and the national athletics coach, Lakshman de Alwis, were among the dead. · THE MANCHESTER ARENA BLAST: Following the attack on the Manchester Arena, concerts and clubs have increasingly become targets of terror attacks. On Monday, May 22nd 2017, over 20 people were killed in an apparent suicide bombing in the foyer of the Manchester Arena in England. The attack followed a concert by US megastar Ariana Grande, which included many teens and youths in the audience. Dozens more were injured. · PULSE NIGHT CLUB, ORLANDO: The deadliest mass shooting by a single shooter in the U.S. occurred on June 12, 2016, when a gunman killed 49 people at a gay nightclub in Orlando. The shooter swore allegiance to IS, but likely acted alone in what is being called both a terror attack and a hate crime against the LGBTQ community. · THE PARIS ATTACK: The attacks in Paris on the night of Friday 13 November by gunmen and suicide bombers hit a concert hall, a major stadium, restaurants and bars, almost simultaneously - and left 130 people dead and hundreds wounded. The most recent one was the Las Vegas terror attack! Las Vegas is one of the most popular travel destinations for Brits – with more than 400,000 spending a holiday there every year. More than 50 people have been killed and 200 wounded after a shooter sprayed bullets into music festival crowds from a hotel balcony in the city. Planning is very important and is the key while an event is organized. It is the first line of defense. Security must be properly incorporated but proportionality is the key otherwise the event companies will burn down budgets and the effectiveness will be deteriorated. 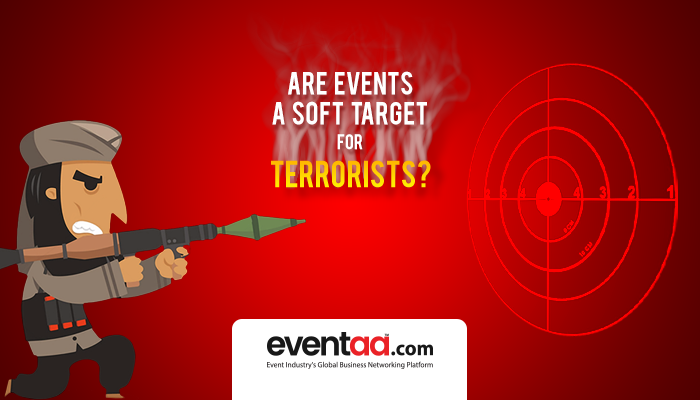 However, there are certain methods event professionals can use to manage the threat of terrorism. (1) Creating more awareness among the employees and training them. (2) Increasing the security staff. (3) A detailed destination research and communication regarding risk management. (4) Working out procedures and contingency plans. (5) Strengthening the attendee screening process. (6) Working closely with the local law enforcement team. “Life is unpredictable,” they say. These methods could be helpful but an uncertainty always remains. What would you do when someone shoots you down from a 22nd floor building?